Who makes time for magic? These kids do. 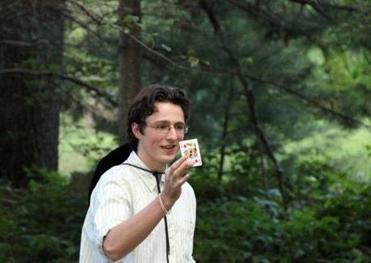 Derek DuBois at the Society of Young Magicians barbecue. The barbecue ended with one guest taking the Ice Bucket Challenge, but other than that, it was not your typical suburban get-together. Then again, what would you expect at a gathering of the Society of Young Magicians? For starters, most of the members were packing — decks of cards, that is. Topics of conversation included sleight of hand, the eggs used in the egg-toss game (were they real or trick? ), and the delicate art of booking gigs. “You’ve got to meet the client’s needs,” said Derek DuBois , a 15-year-old with his own self-promotional T-shirts, and a mother who spent 18 months of Friday nights sitting alone in a booth in the Danvers Applebee’s, watching as a then 10-year-old Derek worked the tables, doing card tricks for tips. Ryan Lally was at the late-summer barbecue in Medway, too, as were the Cipolla brothers, Dan and Andrew. They’re teen magicians whose names likely mean nothing to you, but their talents have become legend in my house, as my 12-year-old transformed himself from a kid who could make a coin disappear with a novelty-store trick box into a middle schooler poised to turn pro. With two birthday parties for 8-year-olds booked, he’s got a magician’s mat for close-up tricks, rehearsed patter, and opinions about cards. “You want an air-cushion finish or they won’t fan,” he explained recently. Me, now, actually. Over the past year, as Josh has spent hours a day practicing cups and balls, linking rings, and something called the “Chicago Opener” — a nice card trick to open a party, by the way — I’ve also gotten an education. What I’ve learned is this: The magic the muggles know about — Penn and Teller, David Blaine, the up-and-comers on “America’s Got Talent,” the guys a step below that, doing corporate events and kiddie parties — is only the part that shows. Mainly out of sight, there are thriving magicians’ societies (the International Brotherhood of Magicians , The Society of American Magicians ); magic conventions; a Houdini Fund to help ill or injured magicians; stores with locations so discreet that if you don’t already know about them, good luck. There are private magic tutors; magic sleep-away camp; and magic moms and magic dads. Arguably less volatile than, say, hockey parents, magic parents are not without dreams of stardom, observed Mike Bent , a Belmont magician and comedian. If the title existed, Bent could rightfully be called the nation’s Magician Laureate, as he’s worked the last eight White House Easter Egg Rolls. “Some of them want their kid to be the next David Copperfield,” he said. Ryan Lally performs some magic at the barbecue. Kim Foehl, a psychiatrist from Newton, just wants her 14-year-old, Constantine, to be happy. 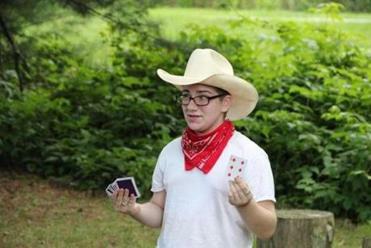 “We had no idea this whole world existed,” Foehl said on a recent Sunday, five hours and counting into the young magicians’ barbecue, as mosquitoes mingled with guests and she applauded a 10-year-old’s sponge-ball routine. Foehl recalled an afternoon when Constantine and a friend walked into Newton Centre to perform street magic, and she slipped into her Prius and surreptitiously drove through town trying to catch a glimpse. Constantine is fairly new to magic, so by the time his family learned that Tannen’s , the famed New York magic store, sponsors a weeklong camp dedicated entirely to magic (no exercise, no outdoor time, just magic from 8 a.m. until bedtime), all 136 slots were taken, some by kids who flew in from Australia, Japan, and Brazil. The camp teaches your basic magical arts — palming, forcing cards, misdirection, and also how to deal with hecklers. With so much to do these days — so many travel sports teams to join, so much “Call of Duty” to play, so many episodes of “Family Guy” to watch — what interests a kid in a mainly low-tech, solitary pursuit? David Oliver , the cofounder and adult director of the 28-year-old Society of Young Magicians’ Boston group — and a very famous magician’s magician — says magic lets shy kids express themselves, and gives them an identity in the socially competitive world of school. “Performing magic allows them to build self-confidence by doing some things that kids who are usually the stars at school can’t do,” he said. It’s hard to say whether magic is more or less popular than it once was. On the one hand, there’s Harry Potter, endless tutorials on YouTube, and, in perhaps the sign of acceptance, an “Iron Chef”-style competition show, “Wizard Wars,” on the Syfy network. But at the same time, both nationally and in the Boston area, there are fewer places to see live magic than there once were, and fewer stores in which to buy tricks and gadgets, said George Schindler, the 85-year-old “dean” of the Society of American Magicians. 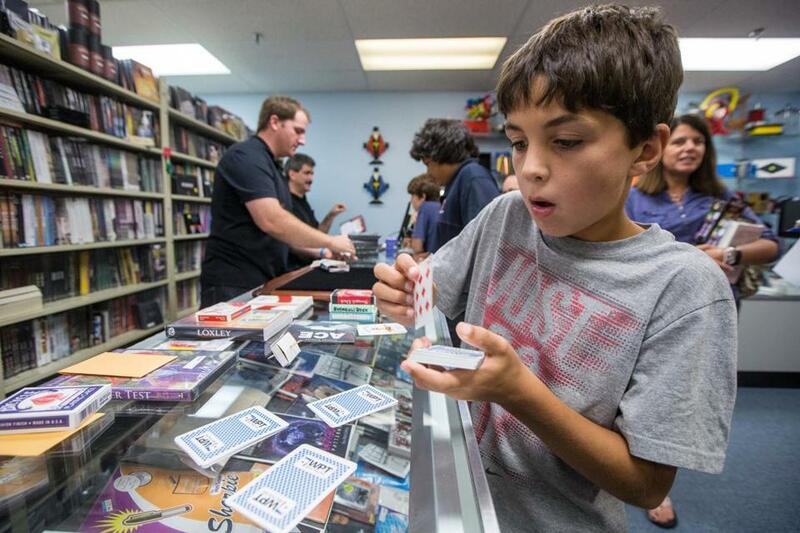 Max Murphy at the grand reopening of Diamond’s Magic in Peabody. “When I was a kid [in the 1940s] there were six magic shops on 42nd Street,” he said. 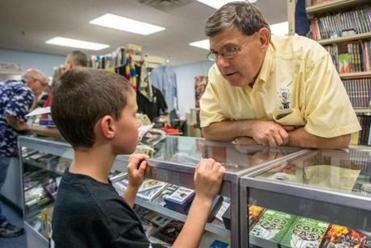 Former owner Eddie Gardner speaks with a young visitor at the newly reopened Diamond’s Magic. Now there are two true magic shops in all of New York City, and, as I’ve come to learn, two pro shops left in all of New England, Magic Art Studio , in Watertown, open Saturdays or by appointment, and Diamond’s Magic, on the second floor of a low-key strip mall in Peabody, down the hall from a mortgage broker. On a recent Friday night, Diamond’s new owner hosted a grand reopening, and Josh and I crept through rush hour traffic from Boston to attend. (Unlike soccer moms, magic moms have a hard time finding a car pool.) Josh bought an invisible deck and a few things I won’t reveal, but I left empty-handed, which was probably not smart, as I learned at the young magicians’ barbecue. “You do know that parents have to perform a trick at the May meeting, right?” the host, Laura Logan, teen magician Kira Schwartz’s mom, said as we chatted on her porch. I mentioned I might happen to be out of town that particular day. Alas, that’s the one trick that’s not allowed: disappearing. 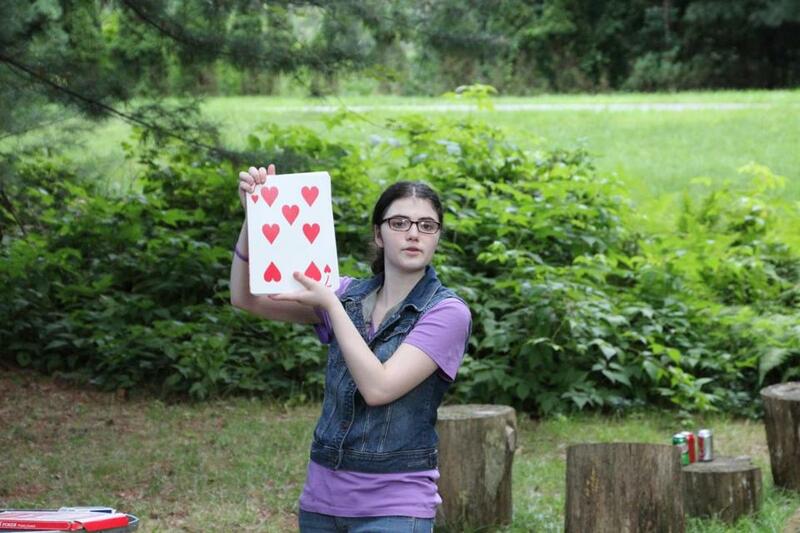 Kira Schwartz does a trick at the Society of Young Magicians barbecue.